We study the problem of optimal syntax-guided synthesis of stochastic Chemical Reaction Networks (CRNs) that plays a fundamental role in design automation of molecular devices and in the construction of predictive biochemical models. We propose a sketching language for CRNs that concisely captures syntactic constraints on the network topology and allows its under-specification. Given a sketch, a correctness specification, and a cost function defined over the CRN syntax, our goal is to find a CRN that simultaneously meets the constraints, satisfies the specification and minimizes the cost function. 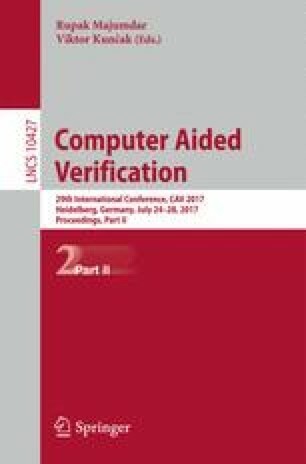 To ensure computational feasibility of the synthesis process, we employ the Linear Noise Approximation allowing us to encode the synthesis problem as a satisfiability modulo theories problem over a set of parametric Ordinary Differential Equations (ODEs). We design and implement a novel algorithm for the optimal synthesis of CRNs that employs almost complete refutation procedure for SMT over reals and ODEs, and exploits a meta-sketching abstraction controlling the search strategy. Through relevant case studies we demonstrate that our approach significantly improves the capability of existing methods for synthesis of biochemical systems and paves the way towards their automated and provably-correct design. This work has been partially supported by the Czech Grant Agency grant No. GA16-17538S (M. Češka), Royal Society professorship, and EPSRC Programme on Mobile Autonomy (EP/M019918/1).